In any season, some crops grow especially well while others flounder. Experienced gardeners know this, so much of their space is given to easy vegetables that almost grow themselves. A spring garden without potatoes, or a summer one without green beans would be unthinkable because potatoes and green beans are naturally prosperous vegetables. I have found that statements such as this can lead to fits of excitement among new veggie gardeners, who may then say, "Oh, yes, of course, flageolets, but what about purple cauliflower?" Ahem. There are easy vegetables to grow and there are hard ones. Cauliflower is a hard one. Get your hands dirty with the easy vegetables first, and the rest will follow. The best way to learn is to build on small successes. I will discuss about a dozen easy to grow vegetables here, but your garden gets a vote, too! What vegetables grew particularly well for you this year, and the season before? Some species will like your site, soil and weather much better than others. For example, if you live in a cool climate you may be bursting with pride over your cabbages, with gardeners in hot summer areas in awe over head-high okra. In any garden, you will eventually discover some "difficult" vegetable that grows like a weed for you. Climactic quirks aside, the vegetables here adapt to many climates and soils. As long as they are planted at the right times, and barring natural disasters like hurricanes and deer, these species will almost always make a crop. Your GrowVeg Garden Planner Plant List will provide you with the best planting dates and spacing information, making it difficult to fail making your vegetable garden dreams come true. Leaf lettuce or salad mixes (often called mesclun) need little more than sun, water, and careful weeding for three to four weeks. Snap peas justify the creation of a fun and functional trellis. The plants make great use of vertical growing space, and yield a high-value veggie even kids like to eat. Potatoes fascinate season after season, and harvesting them from beneath a deep mulch always feels like a treasure hunt. Green beans, whether they grow on bushy plants or long vines, are often named as the easiest vegetable to grow. Try new varieties – they are not all alike! Special variations like flat-podded Italian beans or delicate French filet beans help prevent green bean boredom. Chard is basically a gigantic spinach, and a few plants can produce a phenomenal amount of tender greens that keep their flavour in hot weather. 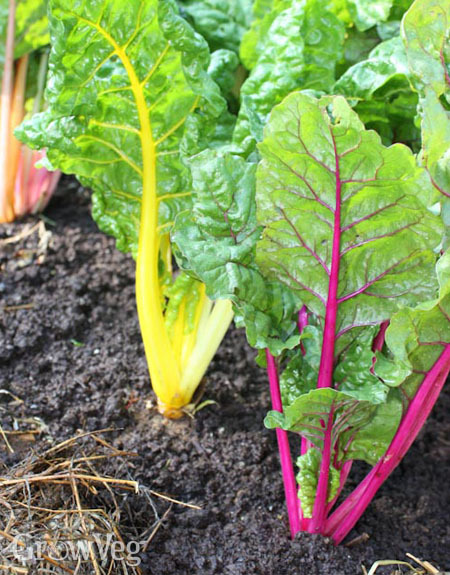 Even gardeners who don’t eat a lot of greens like to grow chard because it’s bombshell beautiful. Tomato growing can be easy if you choose a small-fruited variety. Failure is possible with large-fruited heirlooms, but not with early-maturing cherry or patio tomatoes. Mustard has legions of fans among people who like cooking greens, and those who need plenty of nutritious raw greens for their chickens. Vigorous mustard keeps growing as days get short and cool, even when cut back several times. Turnips can’t quite match mustard for sheer exuberance, but you get both greens and crisp roots for very little effort. As a self-confessed turnip devotee and advocate, I’m constantly trying to recruit new followers of this easy to grow vegetable. Perhaps you have other suggestions for vegetables that qualify as "plant and stand back" crops? What do you think are the easiest vegetables to grow? "Radishes and Cilantro (cool season). Zucchini (warm season). Raspberries (spring) and watermelon (hot season) if you can keep animals from the ripe fruit. Heck, a lot of herbs grow well here in north central Texas: oregano, rosemary, garlic chives (not classic chives), green onion." "Yikes! I meant BLACKberries, not raspberries. Raspberries fry in our heat." "I live in Winnipeg, MB and my beets are amazing. I've been harvesting beets that are bigger than a softball. They are big and are still amazingly flavourful. My Rutabega and Turnips are also a bumper crop." " These comments areusless to us who live in Great Britain!" "Ah, Colorado... a place with high altitude, wide extremes in its daily temperature, a propensity for spring and early summer hail, a short growing season, lack of moisture and lousy clay soil. There is a reason our main crops in the Eastern half of the state are winter wheat, sugarbeets, sunflowers and beef cattle. Even with raised beds, the tomatoes floundered and ended up with blossom-end rot, the squashbugs killed the pumpkins and the heirloom hubbards and the radishes bolted. A late freeze meant we have no fruit again on the apple, pear and peach trees. Still, the pickle cucumbers have put out about eight jars worth of mini-dills so far, we're hoping that the string beans start producing soon and I have plenty of swiss chard to blanch and freeze for later on in the winter. The bugs left the hubbard squash alone, so we'll at least have a few winter squash, and the two pattypan squash bushes and the crookneck and straighneck yellow summer squash are still producing. Maybe, if I'm lucky, we'll get a few carrots from the few that have poked up (planted five packets of them and we have maybe twenty plants). The kohlrabi came up but hasn't done much and the turnips have produced greens, but only small, bitter roots thanks to the 50+ days of over 90 degree heat this summer." "David, not so I think as there are gardening 'zones' in the US that is comparable to our UK weather - I just wish I could find a chart which shows the UK but with an idea of what US zone is appropriate, for example, Scotland has very different conditions to Wales and so on. I'd include a reply here as well for the UK but sadly I'm not experienced enough - perhaps someone with more knowledge will pop by! ;-)"
"Most of the cool maritime climates in North America fall into Zone 6 or Zone 7. You are absolutely correct that few places in the US have climates like those of the UK, in large part due to latitude and maritime influence. Fortunately, many veggies can't tell the difference between continents when planted at the right time. " "Thanks for the info, Barabara! Now, I know which zone relates to the UK, I (we) can use all the US zone info!" "Good ol' Wikipedia: http://en.wikipedia.org/wiki/Hardiness_zone They have a UK map in one of their pics. And under the External Links they give a link to backyardgardener.com which shows USDA Hardiness Zone maps for Canada, Europe/Europa, Australia, New Zealand, China, South America, and, of course, North America: http://www.backyardgardener.com/zone/"
"We have always found that the hardiness zone maps are not much use for growing vegetables because the zones are very broad and only show what will survive winter freezing temperatures - most vegetables are annuals. For example, here in the UK I'm apparently in the same zone as Florida! That's why our Garden Planner uses much more accurate average frost dates to give planting recommendations and we have data for the US, Canada, UK and most of Europe, Australia, NZ and South Africa." "Good Ol' North Carolina:) Well, my procrastination saved me. By planting 2-3 weeks late this year, I was able to produce an enormous crop of tomatoes and squash. Even though our temps we equally hot as Texas (and sporadic) we were saved by cooler evenings (and every degree helped) Slow start to the tomatoes, but I plucked a number of blossoms off to focus on a few tomatoes per plant hoping to pull enough calcium to inhibit blossom-end rot...Seemed to have worked alright. Our tomato plants are still producing and looks like one final round before the season ends. Hooray for hot peppers too! They are beautiful. Not as hot due to the flooding rains, but rich in flavor. We are fortunate to get late frost around here, so, beets, greens and some quick growing squash are being planted soon. Many crops will take about 55 days and a good ol' make-shift cold frame should do the trick to finish the crop. Good Luck for your next growing season!" "I think herbs are so easy to grow and such a money saver. I love using fresh herbs in cooking and used to pay $4-5 a bunch to use just 1/3 of the package and the rest rotted in the refrigerator. Now I just pick what I need and most of them are beautiful to boot!" "I have built up my own what to do list for each month, having taken subscriptions with various magazines over the years. I also keep a notebook and add further reminders from my experience at the end of the summer season so as not to be sidetracked by crops that sound exciting but are not productive in my plot.That way I sift out all the irrelevant stuff and have an e reminder from my e calendar on the first day of each month telling me what I need to do. I can add and update it as new ideas or crops are encountered." "Gardening is not only seasonal it is also annual. Last year we had enough courgettes to feed a small town - this year due to the damp the slugs ate my plants (Twice!). This year I am making raspberry jam for the first time. Turnips and radishes have never worked due to the flea beetle- but that doesn't stop me trying." "We live at 3000' in the north coastal mountains of california. Lots of rain, freezing long winters and hot summers. This year we just didn't have the time to neatly lay out all the seeds, so I basically threw out across the soi beets, turnips, chards, spinach and mustard (of course all in their own space!). Well, we had no bugs and an absolutely wonderful crop of all! We don't do anything special either except its all organic and we dig in last years crops plus manure. I wonder if its because of the climate change....a longer spring, and a little milder summer (only 101 degrees max)." "Here is South Florida it seems to be too humid for squash at anytime of the year, they get attacked by all kind of pests. Okra does great, I can't pick enough. Lettuce, greens and cabbage only grow in winter, since we rarely get frost. Tomatoes only do well with regular spraying as well as eggplants who love our heat. If anyone has suggestions for this type of climate I would love to try other plants, since it can be frustrating, specially during our hot summers, only weed seems to grow." "If hot summers are causing you problems, you could also try black-eyed peas and peppers (jalapenos and Big Bertha in my garden). Neither were producing during the 105F-110F weeks, but the plants looked relatively healthy with my watering three times a week. And then there was my watermelon. It not only looked healthy, but was the only plant that dared to try and produce a fruit during that unbearable weather, though the fruit was half its normal size. And about a week before it was done growing, it finally rained a decent bit after 2-3 months of no rain, and the fruit split open. D'oh! Yup, and okra did nicely all through the heat. My tomatoes died, and my eggplant just sat there." "I live in Sydney, Australia where our summers are hot and very humid. I find one of the easiest plants to grow for a spring crop are artichokes. You do need a fair bit of room though for each plant but placed around the boundary they are both ornamental and delicious. I water them when I remember and don't religiously feed them like my other veges and they never let me down." "I finished planting my Vegetables and now I am having fun planting kids favorite plant and mine....the TickleMe Plant will close its leaves and lower its branches when Tickled! http://www.ticklemeplant.com"
"Dear people, What a great job! Keep up the good work. I am planning to with agriculture. as soon i am so far your soft ware will be number one on my expenses list. Kind regards. Mr. R. Henriquez"
"Okra is a very satisfying crop. Grows well in all conditions and produces more than you'll ever need. Keeps producing until frost if you keep it picked. It isn't to everyone's taste, but it's great in soups and gumbo, and delicious fried. It makes a good sour pickle, too."